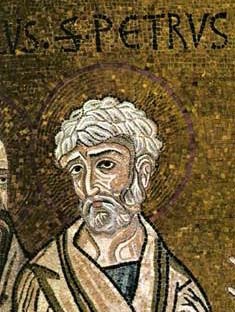 We see here that Peter adopts an authoritarian stance that superficially appears, through a form of coercion quite alien to the kenotic self-giving of the Christian God, to have led to Simon’s compliance with Peter’s own opinion. But this (ultimately hollow) victory is achieved only at the expense of closing down fruitful discourse. Here I suggest how Peter might have responded more appropriately, in the light of modern standards of academic theological discussion. by Simon Peter, Lecturer in New Testament Studies, Jerusalem University of the Way. First of all, I would like to thank Dr Magus for his valuable contribution to the new and rapidly developing field of pneumatology. Many points in his recent, if controversial, paper (Towards a more egalitarian vision of apostleship, Samaria Theological Bulletin, 36-1-28) shed much light on the important role of the Spirit in both the theory and praxis of Christian ministry, and caution us to treat seriously the empowering experience of God-consciousness in all people of goodwill, though (as a matter of declaration of interest) the present article is written from within the specific tradition of the apostolic kerygma. Dr Magus writes with Great Power from a deep pastoral concern, desiring that the benefits of Holy Spirit awareness should be spread as widely as possible, specifically “to everyone on whom I lay my hands”. This generosity of spirit does us all a service in drawing our attention to the fact that restricting this ministry to the apostles chosen by Jesus may well lead to “bottlenecks” in evangelism. No doubt he writes as a response to the very real problems recently demonstrated by the necessity to fetch apostles from Jerusalem to deal with many new members of the Jesus community in Samaria (Evangelist, Philip, 35b), which has already led to much discussion and soul-searching within the guild of New Testament scholars. Dr Magus has also given us a timely reminder, by his novel suggestion that this ministry would be facilitated by financial incentives, of the great value of the Holy Spirit to the believing community. It is all too easy to take miraculous signs, healings, and the exorcism of demons functional disorders for granted, as indeed is also the case for the more universally seen responses to preaching of reformation of life, faith and the power to witness. This value is well represented by the metaphor of money. That the spiritual may indeed be represented in such a physical way should not surprise us, in the light of the incarnation of the divine λογος in an ordinary man, Jesus Christ (I reflect the scholarly consensus in this assessement rather than my own all too fallible impression of Jesus as possessing all majesty, honour and glory: I am all too aware of my “sin of certainty” in relation to his confirmation of the word of the prophets). And so the suggestion that money – and most appropriately large sums of money – should change hands for the laying on of hands is worthy of serious consideration. For all this, Dr Magus’s paper is to be commended. However, there are some respects in which the author appears to fall short in making his case and, more importantly, in his understanding of the essential nature of the kerygma. To be specific: May your money perish with you, because you thought you could buy the gift of God with money! You have no part or share in this ministry, because your heart is not right before God. Repent of this wickedness and pray to the Lord in the hope that he may forgive you for having such a thought in your heart. For I see that you are full of bitterness and captive to sin. Yours sincerely, Ezra ben-Levi (Consulting Editor). Players in the “Openness of ministry” controversy: Simon Peter, D.D., defender of the “closed” view of apostleship. 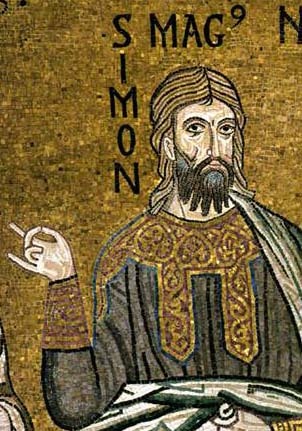 The War of the two Simons – today’s big debate within Evangelicalism.